“The goal of my essay is to address the problems created by America’s myopic response to our Muslim neighbors,” Powers said. “My hope is that readers will be inspired to learn more about both Methodist and Muslim theology and thinking in relation to their current values and social practices. His hope for those reading the full book, edited by Matthew W. Charlton and Timothy Moore, also that it also provides deeper understanding and introspection. “I would hope everyone might pause to study the picture on the cover of ‘Displaced Persons’ (a depiction of Mary, Joseph, and Baby Jesus) to reflect on the historic fact that the Holy Family of Christianity was a refugee family,” Powers said, “as was the Jewish families of our common Abrahamic family and our cousins who were the family of the Prophet Mohammed. 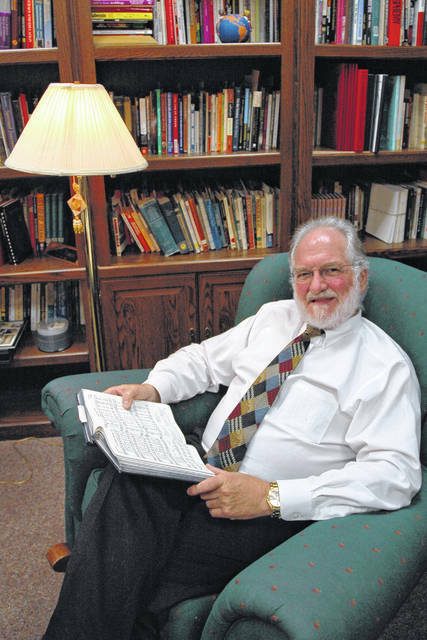 Powers, who joined the Ohio Wesleyan community in 1988, was selected by The United Methodist Church’s General Board of Higher Education and Ministry to contribute to the book based upon his chaplaincy work with refugees, immigrants, and marginalized populations, especially his decades of interfaith ministry as a Christian chaplain working with Muslims and students of other faith traditions. Powers earned his Bachelor of Arts in public policy and ethnology from James Madison College at Michigan State University and his Master of Theology in Hebraic studies from the Boston University School of Theology. He completed postgraduate work in higher education administration at the School of Education, University of Michigan; Doctor of Ministry studies in campus ministry at Wesley Theological Seminary in Washington, D.C.; and Christian-Muslim studies at Georgetown University in Washington, D.C. Learn more about Powers and Ohio Wesleyan’s Office of the University Chaplain, including its longstanding support for students of all faith traditions, at www.owu.edu/chaplain.